Four sections with six swing-out trays. Five available colors: white, black, orange, red or yellow. Anyone can tell you that Joe Colombo was one of the greatest designers of the 20th century. The furniture he created was practical, comfortable and pleasing for the eye. The timeless storage trolley par excellence. Both incredibly practical and pleasing for the eye. Ask any self respecting architect which storage they use and they will tell you: "well...Joe Colombo's Boby Trolley...of course!" Size: 16.15" W x 16.93" D x 37.40" H (42cm x 43cm x 95cm). 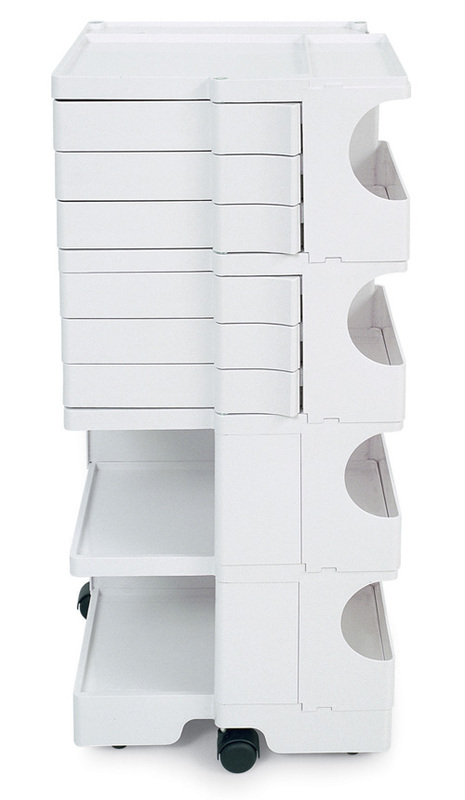 Size drawer height: 2.36" H (6cm).